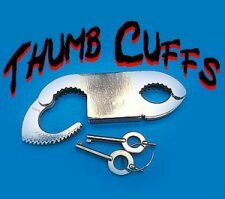 20.00 These are quality non-gimmicked handcuffs at an economical price. While you may not want to use these for true police situations, they look great to magic audiences! Chrome look with keys. 150.00 A cloth bag is presented to the audience. The sides and bottom of the back are show to be sewn completely (they really are). The magician or assistant climbs into the bag and the mouth of the bag is then tied shut with a rope or cord. A covering such as a curtain or sheet is raised up in front of the performer for only a moment and the person quickly makes their escape from the bag. The tied top of the bag is undisturbed! Sound impossible? No Velcro is used. No extra rope is pulled down inside the bag, and no stitching is removed. This is an excellent bag for those who need a bag for the Metamorphosis Substitution Trunk (Sub Trunk) illusion. 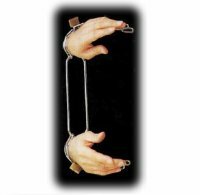 1800.00 This is Harry Houdini's famous escape illusion effect. The magician is handcuffed, placed into a canvas sack and the sack is tied shut. 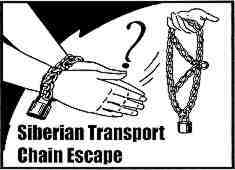 The performer is then placed into a trunk, the trunk is closed, padlocked, tied shut with a rope or chain and so forth. 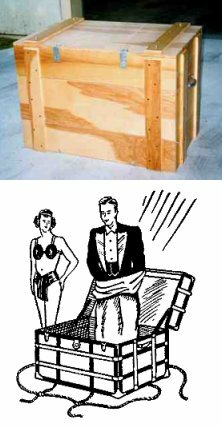 The magician's assistant stands on top of the trunk, momentarily raises a cover, and the two performers instantaneously change places! 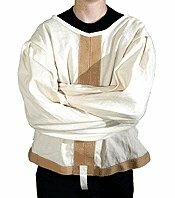 The magician is now free and the assistant is found inside the trunk, inside the tied sack, and handcuffed! We build some of the finest sub trunks ever made. We supply the trunk. You can purchase handcuffs elsewhere on our website and we recommend the Sack-X Escape listed above for the bag. This trunk comes apart and packs flat for transport. Made by Chadwick Illusion Fabrications. Go to www.ChadwickIllusionFabrications.com to download a PDF flyer regarding this great prop. Please note that this effect like all of our other illusions do not qualify for free shipping. However it can be shipped via UPS at cost. 7.50 Volunteers securely tie the magician's thumbs together with pipe cleaners. 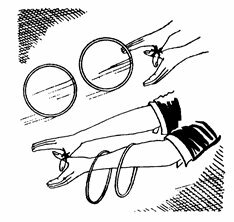 Still the performer can catch rings tossed to him and they penetrate onto the magician's arm! 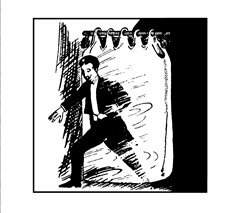 The magician can move his tied hands through a microphone stand or even through one of the volunteer's arms! Pipe cleaners and instructions are supplied.